If you find yourself constantly drifting off into daydreams about traveling the world, backpacking through Europe, or soaking up the sun in the summer on beautiful beaches, you're not alone. Getting the chance to travel and explore around the globe is an incredible experience — but for most of us, the ultimate dream is doing all of it for free. Travel company Busabout wants to give a few lucky adventurers the trip of their life with a unique project: it's hiring six people to travel this summer on an all expenses-paid trip where Instagram decides what you do. Winners of The Great Travel Experiment will get the opportunity to travel across three continents during the summer of 2019, each of the trips ranging from six to 11 weeks in length (covering a total period of 22 weeks, with each trip valued at $10,500). Busabout is searching for six content creators in total — three content creators who enjoy sharing their experiences and love documenting their trips in front of a camera, and three videographers with impressive editing skills who know how to create beautiful filmed content. The six winners will be grouped into pairs of one Instagram content creator and one videographer, and will tell the stories of their summertime travels through social media. Honestly, it sounds like a dream. Busabout's Great Travel Experiment is nothing close to your average summer vacation, though. There's a catch to the experience: Votes from Busabout's Instagram followers will decide which specific activities winners embark upon while on their trips. "Anything from the flavour of ice-cream you'll slurp on in New York, to whether you'll sky-dive the Swiss alps. Our winners will have to be prepared for anything, and be ready to embrace traveling in the moment," the company explains on the contest page. If you live for spontaneity, this is pretty much your dream travel idea. The destinations for The Great Travel Experience include Asia, Europe, and the USA. The trip will kick off with six-week journey through Southeast Asia starts in May, followed by a six-week coast-to-coast adventure in the United States that'll go from California to the South, and it ends with an 11-week bucket-list worthy travel to Europe throughout cities like Paris, Budapest, and Rome. So, how do you apply? You need to create and upload a 60-second YouTube video showcasing your hometown — and for bonus points you can follow @Busabout.Official on Instagram, post this image, and explain in the caption what destination you’d most love to check out. 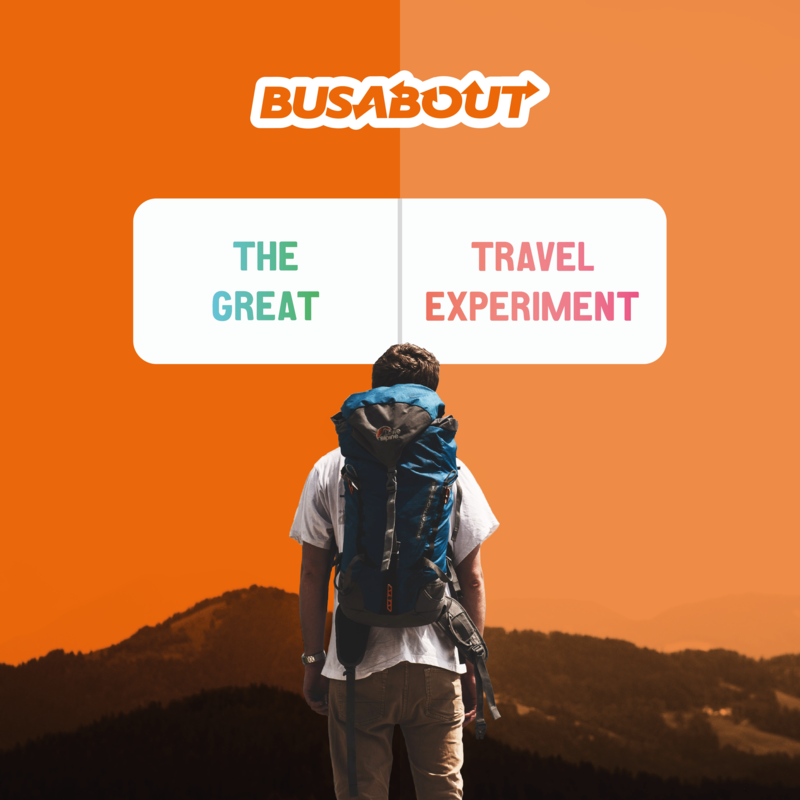 Busabout tells applicants to be sure to include the Great Travel Experiment logo as part of the video thumbnail, add the hashtags #travelexperiment and #busabout in the description of your video, and set your application video to public visibility. "Be creative as possible, but remember the main thing we're looking for someone who can tell a great story," the company advises. The application is open until April 8, so if you want to take the plunge be sure to start brainstorming for your YouTube submission now. May the best travel lovers win.